Tyrone's Ronan McNamee celebrates after the Allianz FL Division 1 round 6 victory over Dublin at Croke Park. ©INPHO/Oisin Keniry. 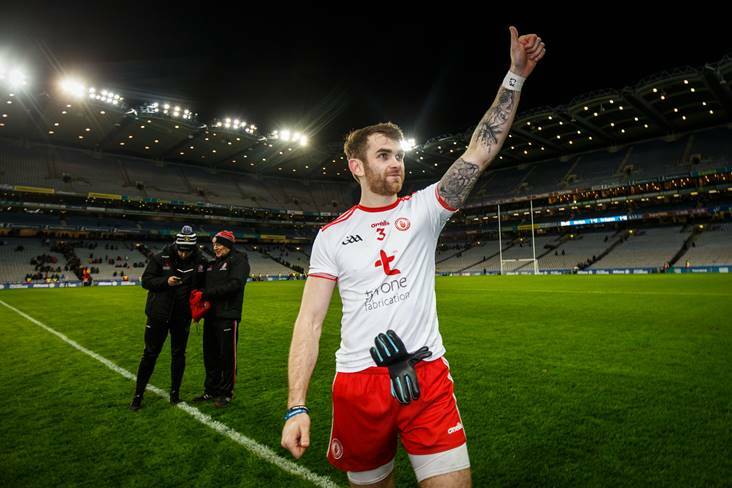 Mickey Harte masterminded a long overdue victory for Tyrone over Dublin on Saturday night. Dublin’s below-par performance disappointed Jim Gavin. James Horan and Mayo brought Kerry’s winning run to an end in Tralee. Peter Keane will hope the Kingdom can return to winning ways against Roscommon next Sunday. Relegation is not a foregone conclusion as far as Roscommon manager Anthony Cunningham is concerned. Kevin Walsh and the Tribesmen will be up against Tyrone in round 7. Monaghan boss Malachy O’Rourke was sent to the stand during his team’s three-point win over neighbours Cavan. Barring a freak set of results next Sunday, Mickey Graham and Cavan will be plying their league trade in Division 2 in 2020. Following their win over Clare, Andy McEntee and Meath have one foot in Division 1 for next year. Cian O’Neill wasn’t a happy camper after Kildare were almost caught on the line by Tipperary in Newbridge. Declan Bonner’s Donegal charges overturned a five-point half-time deficit against Cork to maintain their push for promotion. Paddy Tally will demand improvement from his Down troops ahead of next weekend’s crucial clash with Louth. Laois secured the local bragging rights against Offaly and John Sugrue was proud of how his players went about their business. Derry got the better of Leitrim by seven points but Damian McErlain is expecting a different challenge when they renew acquaintances in the Division 4 decider at Croke Park. Kevin O’Brien guided Corofin to back-to-back Andy Merrigan Cup successes and they did it in style. Dr Crokes selector Niall ‘Botty’ O’Callaghan took his hat off to the Galway champions.